Viewing topic "Help me! My voices in pattern mode makes screechy sounds, it destroys my live performances"
For nearly every tune we play in my band I use pattern mode. I have layered patches and divided them into different areas of the keyboard. It is so strange, feels like torture! When the “screechy sounds” occur, are there samples being used? If so, does it happen if you play a Preset sound? No. It is patches/voices that I use in pattern mode. Like two elecric pianos, two pad sounds. So 4 in a layer. In one third of the keyboard. My motif has played these pattern modes just fine for a year. And then. Boom, screeching sounds appeared. AND it is periodical. I couldnt make it do the screeching sound at home yet. Only at rehearsal and at a gig it happened this last week. So when it happens on stage its critical. I understand that you’re using layers/splits in Pattern mode. What I’m asking is if the Voices being used are Presets (from the PRE banks of the XF), or are they from sample-based libraries that were loaded? Unfortunately, problems of intermittent nature can be difficult to track down. Can you think of any differences in the conditions at home versus the rehearsal and/or gig locations? Is the power reliable, etc.? yes its voices from the prebanks. In rehearsal and gigsituation I am connected to a mixer. And a sustain pedal is used. At home, just power an headphones. OK, I just wanted to rule out the possibility of sample memory problems. Make sure that the mixer doesn’t have phantom power (meant for condenser mics) turned on for the inputs you’re connecting to - it can damage the Motif’s line outputs. If you aren’t using line outputs at home, you won’t be able to tell if there’s such a problem. Also, temperature or humidity extremes can cause some difficulties. If you have air conditioning at home, but not at the venues, the problem might be related to that. So if I accidentally turned on phantom power, could that have damaged the line outputs so that they should be repaired? Or do you just mean - make sure not to have phantom power on? I now noticed that the automatic power of dont work anymore. The motif just keeps being turned on! Certainly make sure phantom power is turned off. However, if phantom power has been on, damage may have already occurred. It can be cumulative, with longer and more frequent exposure making the problem more likely. What happens is that the output muting transistors can become leaky, which can cause various audible effects, including a type of distortion. I have posted about the problem several times on the forum. If possible, try using the XF with external amplification at home. If you determine that the “screeching” is at the line outputs, but not at PHONES, the muting transistor problem is a possibility. We could then discuss that further. However, it’s also possible that some difficulty outside of the XF is causing the problem. Your member profile indicates that you’re located in Denmark. Auto Power Off is a feature required in Europe - I’m in the US, and my XF doesn’t have it. 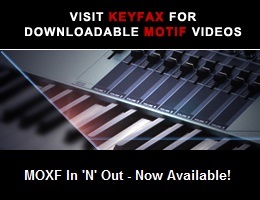 I’m therefore not familiar with its operation in a Motif XF. The MOXF, which was designed later than the Motif XF, has the feature standard, and it can be turned off in Utility mode. It may be that your XF should be seen by a Yamaha service technician. A friend is telling me, that the phantom power only affects the xlr - mic line in. Generally the mistake is periodical. In one verse with mistake. Next verse no mistake! Guess I have to buy a new one. Feels like this one cant be trusten. Faulty production or something. That depends on the particular mixer. You’ve made it clear that the problem is of an intermittent nature. Problems of that sort are difficult to determine the cause of. That’s one way to determine if the problem is internal to the XF. Could it be a problem with the processorboard, as it seems, that the motif xf cannot manage to produce the sounds it should? The local yamaha-servicecenter suggests this. But is not an extremely seldom case? Could yamaha want to help in such a case? Since changing it is very very expensive. Not having heard the particular sound makes it harder to diagnose. Incorrect sounds could be related to a problem with the tone generator chips, Wave ROMs, DACs, power supply, etc. If it only occurs with certain Voices, it’s more likely to be on the digital main board. If you want to ask for assistance from Yamaha, I suggest that you contact them directly. See the last page of the Owner’s Manual to find the office in your region. I should have uploaded a soundbite earlier. Here is the terrible sound from my bands gig this weekend. Ouch. OK - it doesn’t sound good, but it would help to know what it’s supposed to sound like. Can you save an “All” file, “without sample”, and attach it to a message? If so, mention which Pattern you used in the mp3 clip. If you’re concerned about distributing certain things that are stored in your XF, you could save a backup “All” file for yourself, initialize things on the XF by using my All User Initialized.X3A (see http://www.motifator.com/index.php/forum/viewthread/471009/), and then only copy the Pattern back to the XF. After you save an “All” file to post, you can reload your own data. So that you can hear with and without the bug. Two recordings side by side, one good one bad. In the end my solution has been to buy one more motif xf7. I copied the “old” one to the “new”, and its playing without problems. So the theory that the processorboard is faulty seems to be correct. Its extremely expensive to fix. I am also deeply surprised that it at all can happen. Extensive search indicates that its a unique case. Its like your keyboard suddenly attacks you with terrible uncalled for sounds.